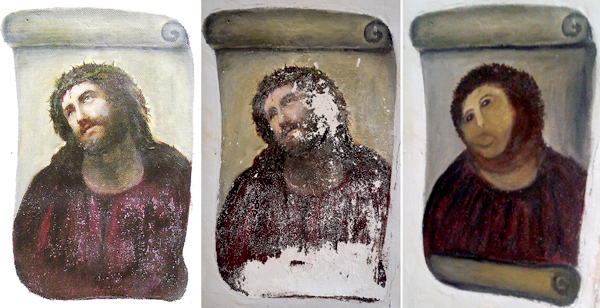 A well-intended elderly woman in the city of Borja, Spain attempted to restore a century old fresco by artist Elias Garcia Martinez’s entitled “Ecce Homo” (“Behold the Man”). The church going octogenarian soon found she was in over her head and produced an image that has become a sensation around the world. Many have dubbed the transformation “Beast Jesus” due to the figure’s monkey-like appearance. “The woman, Cecilia Giménez…said on Spanish national television that she had tried to restore the fresco, which she called her favorite local representation of Jesus, because she was upset that parts of it had flaked off due to moisture on the church’s walls. Ms. Giménez said she had worked on the fresco using a 10-year-old picture of it, but she eventually left Jesus with a half-beard and, some say, a monkey-like appearance. The fresco’s botched restoration came to light this month when descendants of the 19th-century artist, Elías García Martínez, proposed making a donation toward its upkeep. 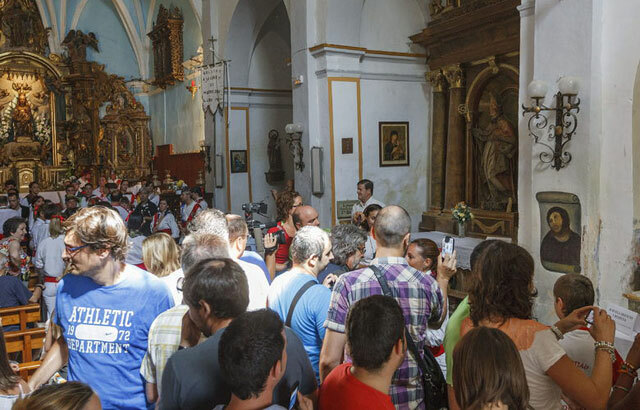 And as it turns out tourists are flocking to the city of Borja to see the botched art restoration in person.